Let’s be honest, the road to fitness can be a bit overwhelming. Most make the mistake of relying too heavily on motivation, or simply trying to accomplish too much in a short amount of time. When you don’t get the results you want, it’s pretty frustrating. So what’s the solution? Is there any way to help raise the chance of fitness success? Thankfully there is a simple and effective way to achieve your goals. And that is: set a training schedule and stick to it. Sounds a little too simple doesn’t it. But it all boils down to building habits and staying consistent. So let’s get into exactly how building habits will help you achieve your fitness goals. So what is habit-based coaching and how does it work? Well basically it focuses on the principle that you should focus on less in order to achieve more. What does that mean exactly? Well basically most of us have a tendency to try and turn our lives around in a day. However, this approach usually leads to disappointment and a lack of results. Do only one habit at a time. Do not break this rule, because I assure you that if you do multiple habits at once, you will be much less likely to succeed. Trust me, you should put all your focus into one habit. If you try to build multiple habits at a time, chances are it will end in failure. Choose an easy goal. Don’t decide to do something really hard, at least for now. Later, when you’re good at habit changes, you can choose something harder. But for now, do something you know you can do every day. In fact, choose something easier than you think you can do every day. If you think you can exercise for 30 minutes a day, choose 10 minutes – making it super easy is one of the surest ways to ensure you’ll succeed. Choose something measurable. You should be able to say, definitively, whether you were successful or not today. If you choose exercise, set a number of minutes or something similar (20 minutes of exercise daily, for example). Whatever your goal, have a measurement. Be consistent. You want to do your habit change at the same time every day, if possible. If you’re going to exercise, do it at 7 a.m. (or 6 p.m.) every day, for example. This makes it more likely to become a habit. Report daily. You could check in every 2 or 3 days, but you’ll be more likely to succeed if you report daily. This has been proven over and over again in the Challenges. Keep a positive attitude! Expect setbacks now and then, but just note them and move on. Learn from your mistakes instead of dwelling on them. In short, fitness can be an overwhelming journey if you try and tackle too much at a time. Don’t fall into the motivation trap, and instead rely on discipline and building habits. Fitness requires patience and consistency, so stay positive and stick to what works. 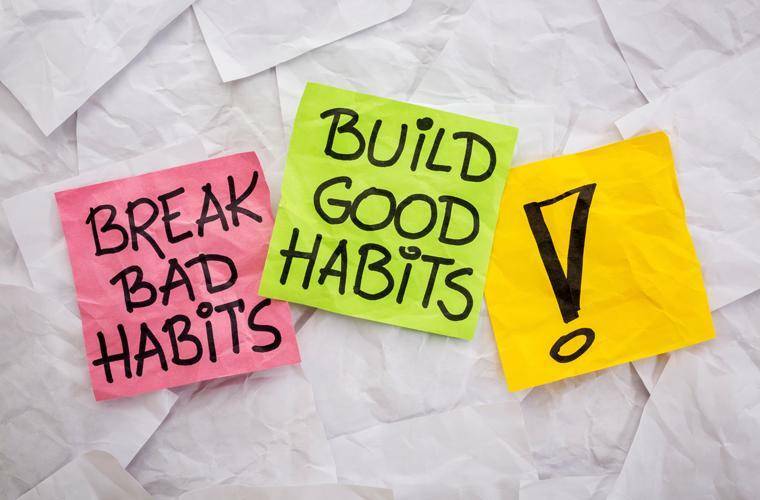 Try building up one good habit at a time and your success rate will skyrocket. Chris Friesen is a gym owner, personal trainer, online fitness coach and former “fat dad” living on 60 beautiful acres of countryside in rural Canada. He specializes in helping busy parents shed body fat quickly, WITHOUT becoming gym rats OR giving up the foods they love to eat. In his spare time, he enjoys spending time with his wife and 3 kids, sitting in his hot tub out in the snow with a glass of bourbon, and yelling at his (many) misbehaving barn cats. What’s All The Fuss About The Keto Diet? Is Perfectionism The Reason You’re Stuck In A Rut? What’s the Big Deal about Carbs? Building Muscle: Heavier Weights or More Reps?